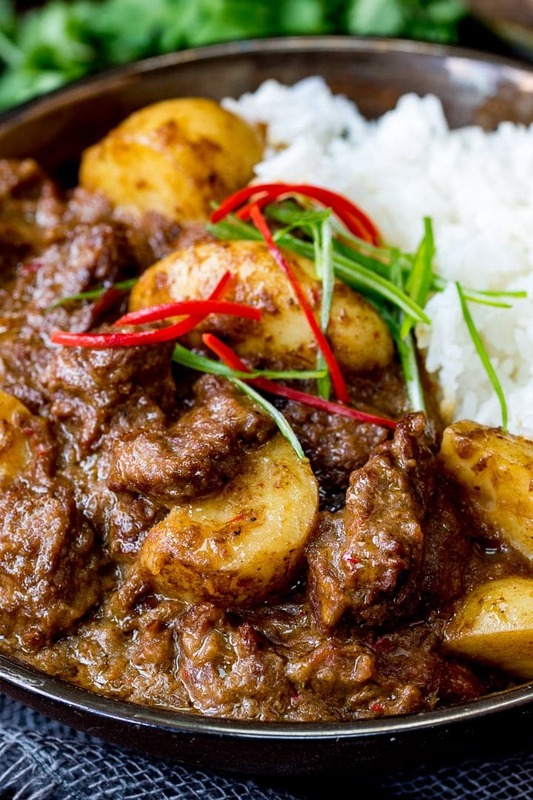 Slow Cooked Beef Massaman Curry – Rich, fall-apart slow cooked beef curry in a spicy homemade sauce with new potatoes. Perfect comfort food! Make extra and freeze some for a busy weeknight. I made the massaman curry paste for this meal from scratch. It’s pretty simple to do, but shop bought curry paste works really well too. 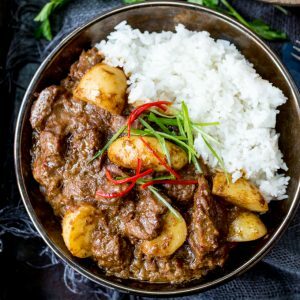 I’ve used Massaman, Korma and Madras pastes (yes, I know the last two are Indian rather than Thai, it was what I had in at the time) and they all tasted great. If you do go with a shop bought paste, I’d recommend you reduce the amount to about 4 tbsp, as shop bought it usually more concentrated. This recipe was first published in May 2014. Updated in June 2018 with new photos and cook’s tips. Like the new photos? Ok (cringe) here’s the original photo: I was so chuffed with that photo back in May 2014! Eek! Hopefully I’ve improved!! Can anyone recommend a good paste to buy? If you do go with a shop bought paste, I’d recommend you reduce the amount to about 3 tbsp, as shop bought it usually more concentrated. 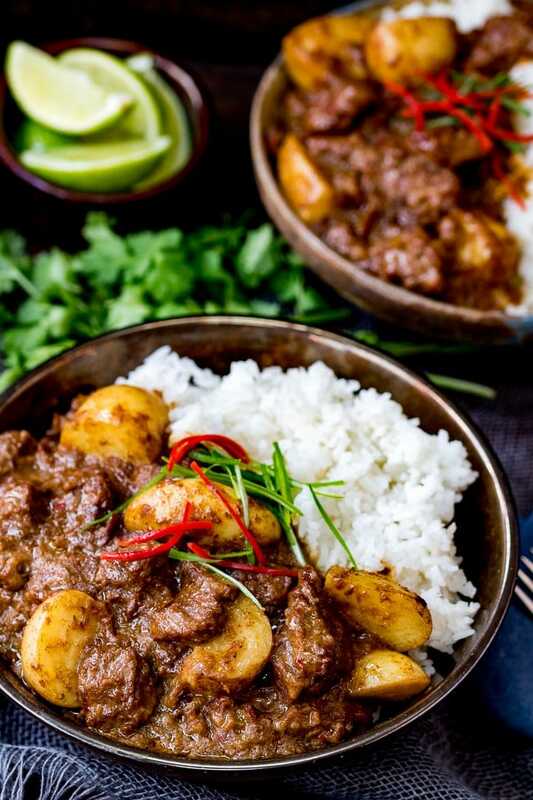 I want to make the beef brisket recipe with the this Massaman sauce as you suggested – do I just supplement the curry paste for the marinated and the tomatoes with the stick and coconut milk? 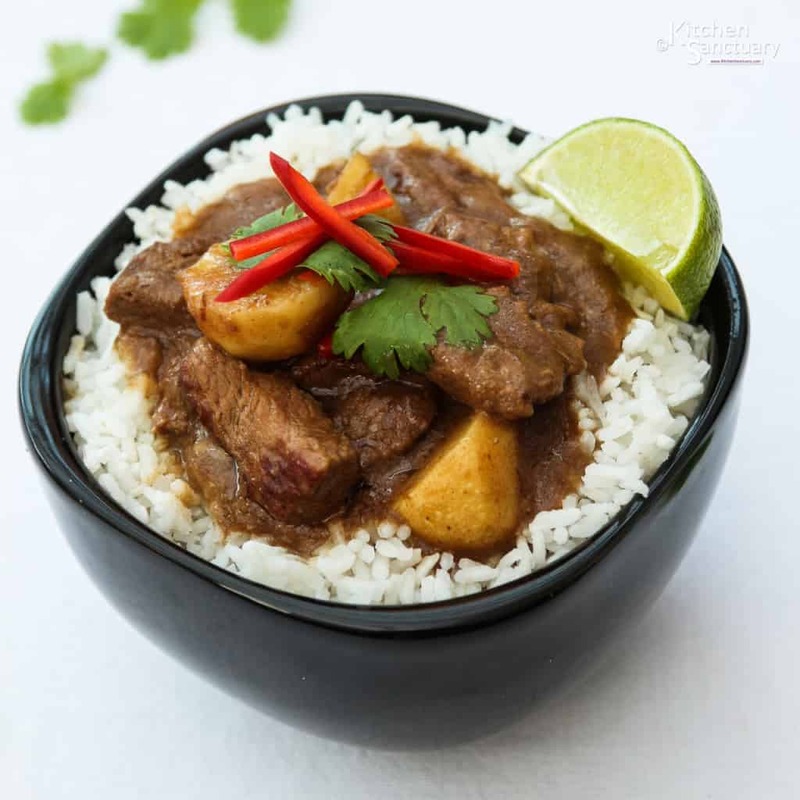 I’d follow the Massaman curry recipe, but swap the beef chunks for brisket. No need to coat the brisket in cornflour/cornstarch before searing it, but do season it with a good grind of salt and pepper. Cook in the oven at 140C/275F for about 3 hours (for a .75kg-1kg brisket) – adding the potatoes for the last 30 mins. Keep an eye on it for the last hour or so to ensure the liquid doesn’t dry. You can add a splash of stock or water from the kettle if it does start to dry a little. What red chiles did you use? Recently, I discover your website and your recipes and my first try was the ORANGE CHICKEN. Everyone at the table enjoyed it. I’ve tried a few of your recipes and they’re all fantastic so far and this is next on my list. 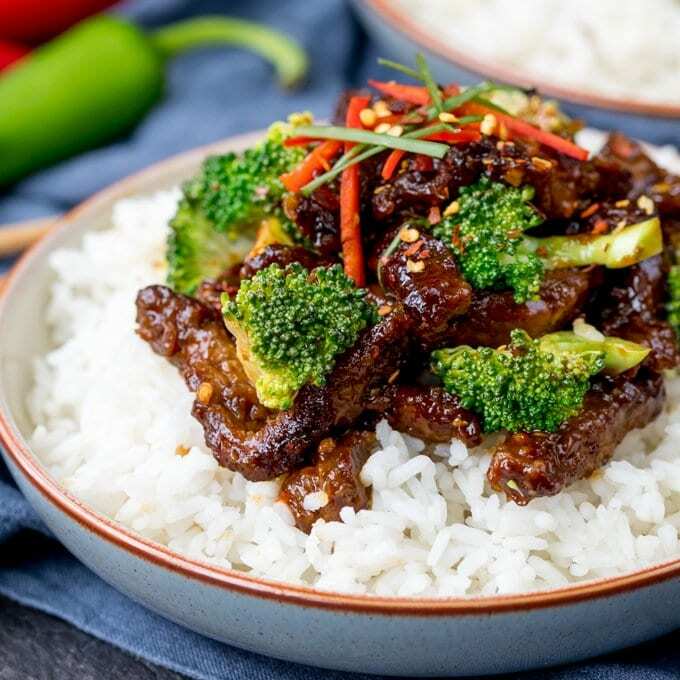 I was hoping to cook this in the slow cooker, how long would you recommend to cook it for on either high or low settings? Hi Mike, I’d recommend cooking this for 3-4 hours on low or 5-6 hours on high. You can add the potatoes in at the beginning, or if you want them to be slightly firmer, add them in halfway through the cooking time. 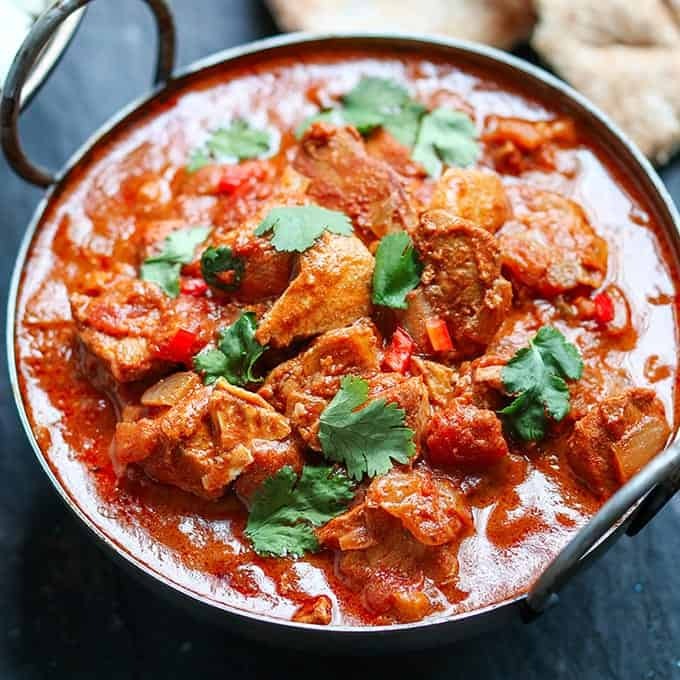 Cooking in the oven reduces the sauce more than in the slow cooker, so you may also want to reduce the amount of stock by around 180ml-200ml (3/4 cup). It’s a good idea to keep an eye on it if you’re going for this less-liquidy version – just to make sure it doesn’t dry out. 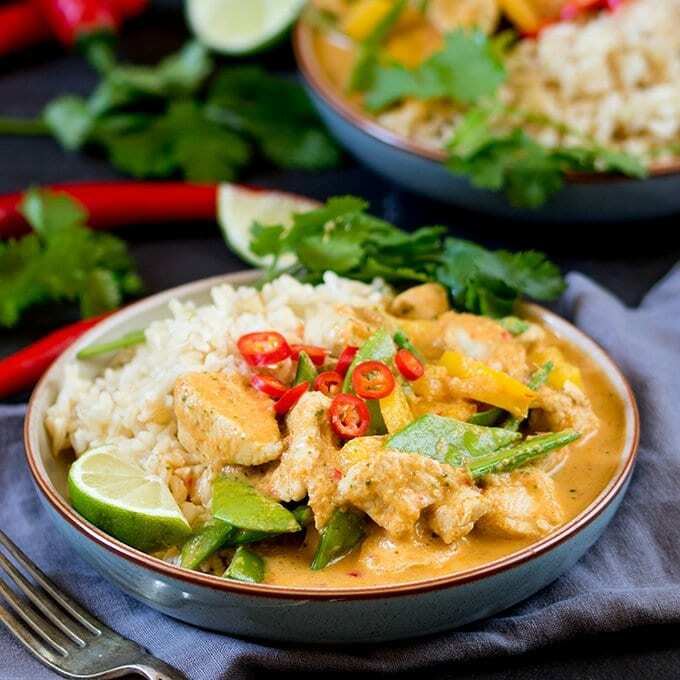 It’s funny I have just spent this week creating a bunch of Thai recipe for my July posts. I didn’t do a massaman curry though. 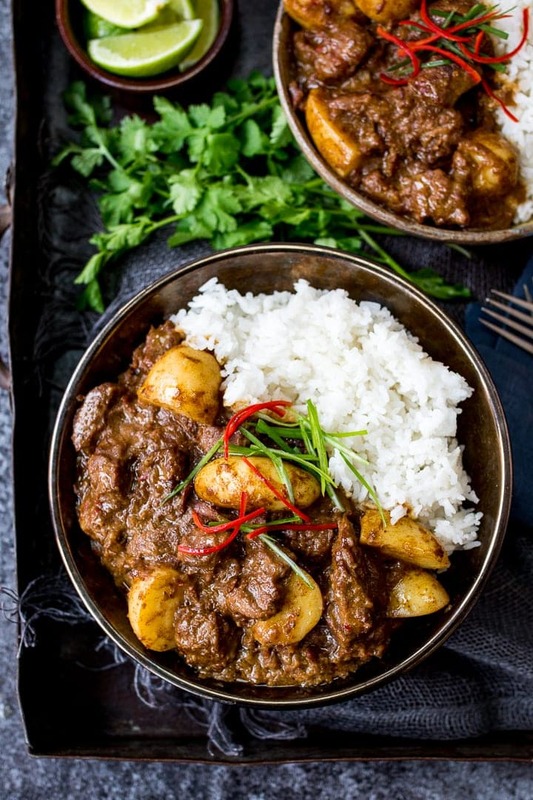 This sounds delicious, it’s one of my favorite curries. And your photos look great! I cringe every time i look back on mine too – I’ve got some god-awful horrendous ones! Hi there, if I was to put this in the slow cooker, what setting and time would you recommend? And when to add the potatoes in the slow cooker? Hi Gretel, I’d recommend cooking this for 3-4 hours on low or 5-6 hours on high. You can add the potatoes in at the beginning, or if you want them to be slightly firmer, add them in halfway through the cooking time. Can you use a slow cooker instead? Hi Amber, I’d recommend cooking this for 3-4 hours on low or 5-6 hours on high. You can add the potatoes in at the beginning, or if you want them to be slightly firmer, add them in halfway through the cooking time. The best curry I’ve ever had at home. I added a few extra chillies to the paste mix because I like my curry quite warm, and wow what an incredible dish! just made this for dinner LOVED it. It was very yum thank you, great recipe. 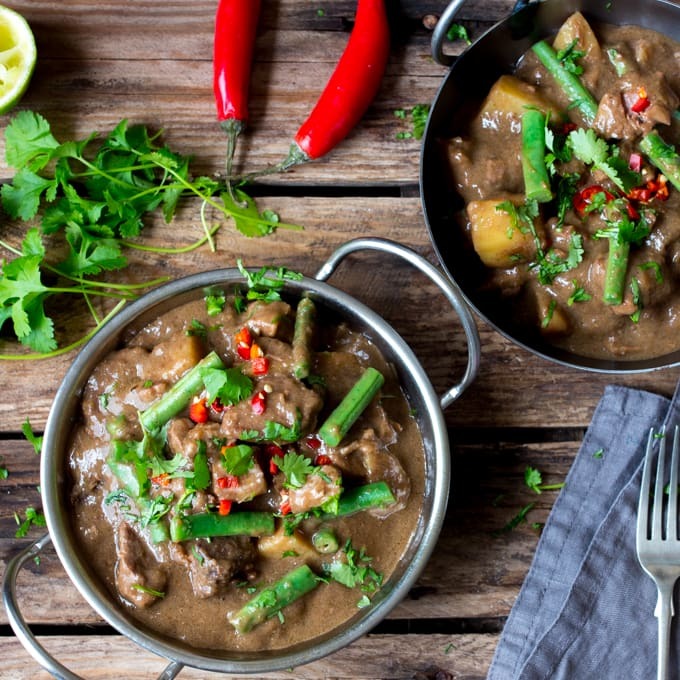 Massaman is one of my favourite Thai curries – this looks stunning.